Jemma Thake as reliable as ever helping West Suffolk to beat yet another club record. West Suffolk Athletic Club won their second fixture of the season in the Southern Women’s League. After winning the previous match by 27 points, their fixture at Parliament Fields in London was much closer. But West Suffolk’s squad, weakened by school trips and other necessary absences, worked exceptionally well together to win by 11 points. They amassed 209 points with hosts London Heathside runners-up, the other four competing clubs being beaten out of sight. But it was not until late in the day that West Suffolk claimed victory by taking two of the three relays. It was not a day for personal bests, however, with a biting wind blowing up the finishing straight. But there were exceptions. Stephanie Ensten, from Wickhambrook near Haverhill, had an excellent competition, recording bests in discus (14m) and high jump (1.30m). Top sprinter Jemma Thake was as reliable as ever, easing to victory in both 100 metres and 400 metres, the latter in a time of 59.3 sec, marginally outside her personal best. She was also part of an all under-17 4x400 metres relay squad which broke yet another club record, the latest of many longstanding records already improved this season. The squad recorded a time of 4 min 38.6 sec, to knock half a second off the previous record set in 1994. 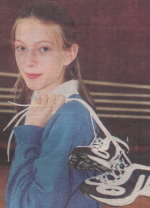 Another local athlete who played a prominent part was Wickhambrook’s Dianna Firbank, who had B string victories in shot putt and high jump. This weekend the youngsters are in action at St Ives for their second fixture in the Eastern Young Athletes league,hoping to improve on last place in their opening match in their first season following promotion from Division 2. Some of the more experienced athletes will be missing, as they will be in action at Watford at the South of England Under-20s Championships. West Suffolk AC is holding an Open Athletics meeting on June 4 Bank Holiday. preceded by a charity fun run. The Fun Run will start from West Suffolk Arena at 2pm and all profits from it will be donated to St John Ambulance. 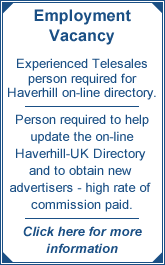 For further details, contact Ray Wells on 01842 860628 or Marilyn Anness on 01440 706635. CAPTION: Jemma Thake as reliable as ever helping West Suffolk to beat yet another club record.